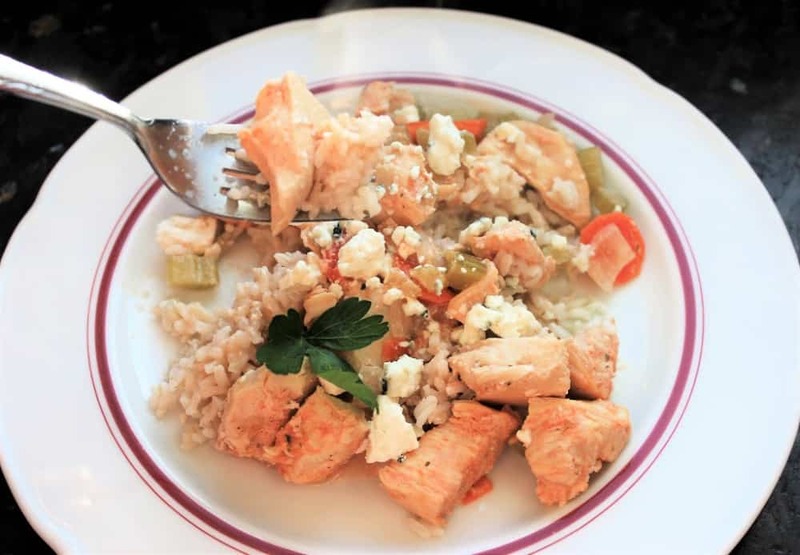 This Slow Cooker Buffalo Chicken & Rice recipe is only 10 WW Points but full of flavor! You’ll feel like you’re eating a plate of buffalo chicken wings with celery sticks and blue cheese dressing. BUT without all the greasy, fatty calories. And I’m here to tell you, it’s really good! I promise, you will not miss traditional buffalo chicken wings! Well, maybe a little bit, but really not that much! And when you know that you’ve saved a ton of fat and calories, you’ll want to make this all the time. Imagine the above dish with a bottle of your favorite hot sauce sitting next to it and the blue cheese crumbles and chopped celery topping off the hot chicken and rice. It is melt-in-your mouth delicious! The beauty of it is that you can make it as hot and spicy as you want to by adding more hot sauce and chile pepper. I prefer to make it on the mild side and then add hot sauce to taste. 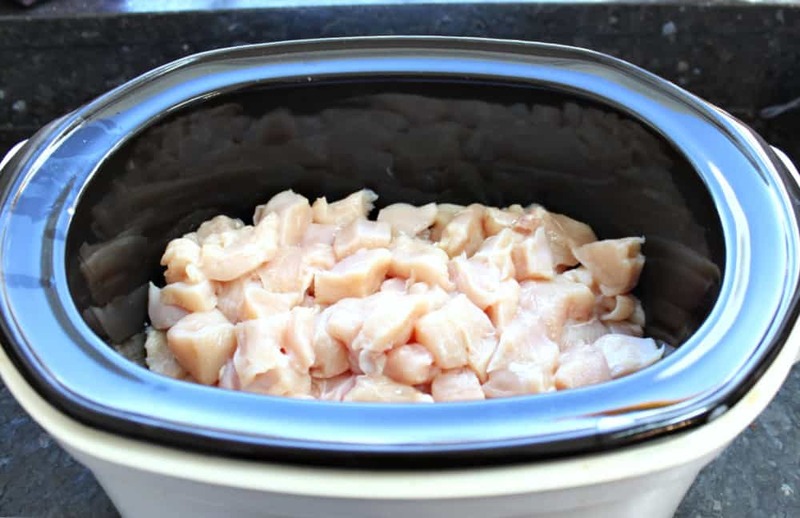 The first step is to cut the boneless, skinless chicken breast into one inch pieces and place into the slow cooker. 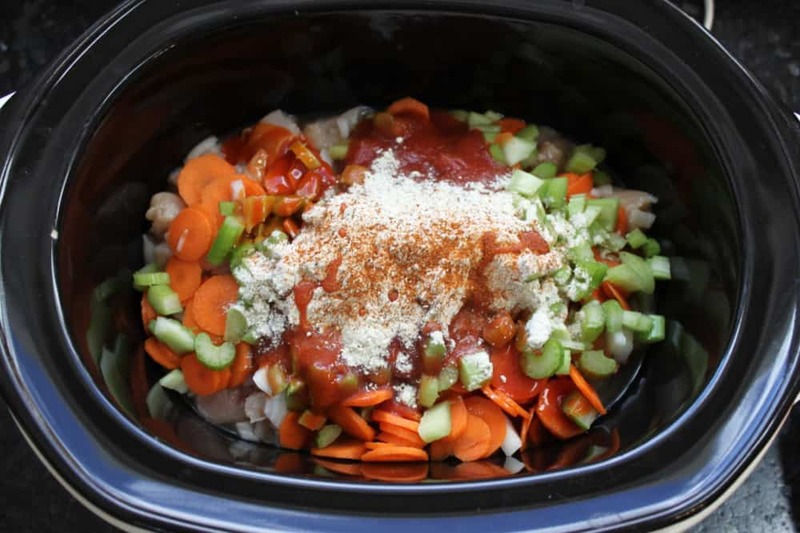 Then throw on the onions, carrots, celery, chicken broth, tomato sauce, chile pepper, ranch dressing mix, and hot sauce, mix well, and let the slow cooker do it’s thing. Once it’s all cooked through, you’ll add the cream cheese and cook for an additional 30 minutes. In the meantime, cook your brown rice so it’s ready to go. This recipe is a great alternative to traditional buffalo wings with way less calories and fat and only 10 WW points per serving. Slice green onions in thin slices, separating the white and green parts. 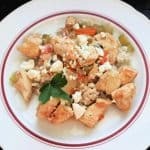 Combine white spring onion slices with the cut up chicken breast, sliced carrots, sliced celery, chicken broth, tomato sauce, chile pepper, ranch dressing mix, & hot pepper sauce into the slow cooker. Mix well and cook on low in covered slow cooker for 6 hours or on high for 3 hours. After cooking time, mix in the green parts of the spring onions along with the cream cheese. Cook for an additional 30 minutes. 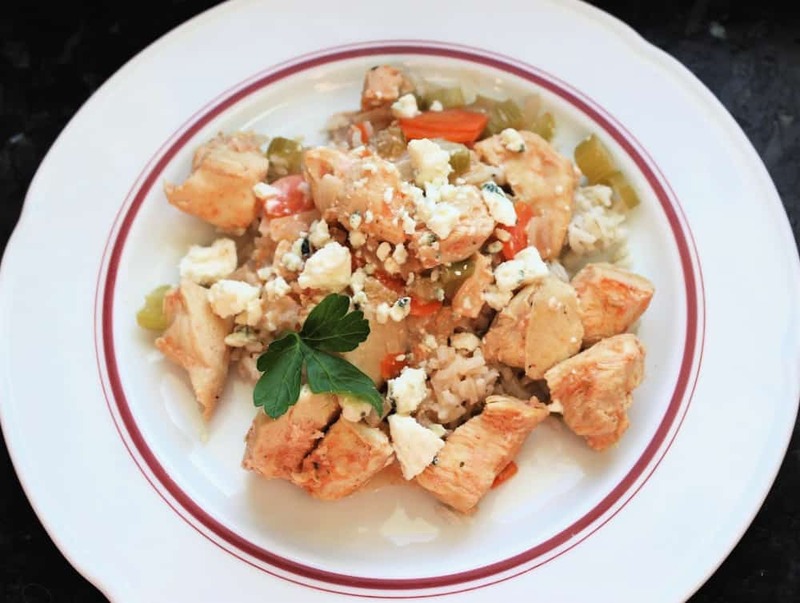 Serve chicken mixture over brown rice. Add crumbled blue cheese and celery on top. Keep hot sauce handy to add to taste. I didn’t actually try it out for myself until after I took these pictures. So, after taking a bite, I realized that extra hot sauce really makes it good! Just imagine these pictures with hot sauce drizzled on top. 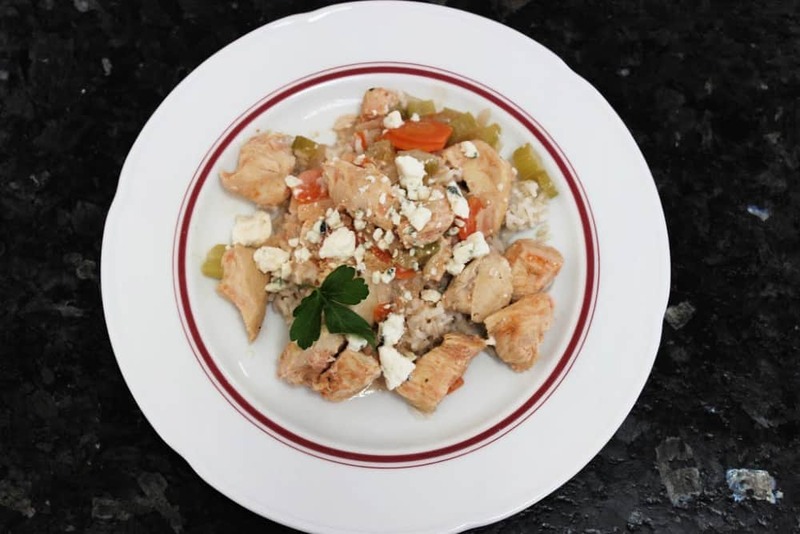 After eating this Slow Cooker Buffalo Chicken & Rice, you will be so glad that you didn’t opt for the greasy buffalo wings. And this is great as leftovers too! What flavor is your favorite chicken wing? Let us know in the comments and we’ll come up with a great WW recipe for it! Check out some of our other popular WW recipes here: Crab Cake with Remoulade Sauce, Asian Chicken Salad, Blackened Tilapia with Radish Cucumber Salsa, and Broiled Lamb Kebabs with Spinach Lentil Salad.